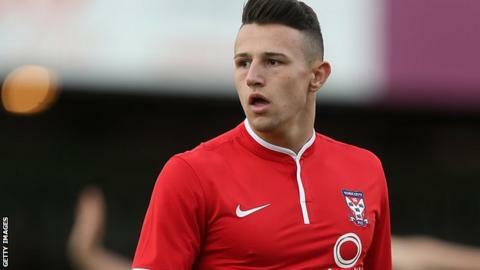 Wes Fletcher scored twice as unbeaten York City won a five-goal thriller against 10-man Stevenage to secure their first League Two win this season. Michael Coulson curled in a free-kick and Fletcher slotted in to give the visitors a two-goal advantage. Boro then had Andy Bond sent off for a lunge on Fletcher but a Chris Whelpdale header and Tom Pett shot made it 2-2. However Pett felled Marvin McCoy in the area and Fletcher held his nerve to score the winner from the penalty spot. "I'm fed up talking about decisions. That referee was completely blocked on the penalty. We looked at the footage and he can't see it. It wasn't a penalty that should have been given. "We made a mistake early on. The ball was in the back of the net from a shot where we put a three-man wall instead of a four-man wall. I don't know why we did that. That was an error. "Mistakes happen in football and it was in our hands to us to get back into the game. If we kept eleven men on the pitch we would have won the game. "We were the better side in the second half. I said to them at half-time that it's a test of character - an opportunity for us all to show the Stevenage public what we're all about. I thought the lads did stand up in the second half." Match ends, Stevenage 2, York City 3. Second Half ends, Stevenage 2, York City 3. Tom Pett (Stevenage) wins a free kick on the left wing. Substitution, York City. Ryan Jarvis replaces Lindon Meikle. Corner, Stevenage. Conceded by Keith Lowe. Substitution, Stevenage. Calvin Zola replaces Jon Ashton. Corner, York City. Conceded by Jon Ashton. Jake Hyde (York City) is shown the yellow card. Attempt saved. Simon Walton (Stevenage) right footed shot from outside the box is saved in the centre of the goal. Hand ball by Marvin McCoy (York City). Goal! Stevenage 2, York City 3. Wes Fletcher (York City) converts the penalty with a right footed shot to the centre of the goal. Penalty conceded by Darius Charles (Stevenage) after a foul in the penalty area. Penalty York City. Marvin McCoy draws a foul in the penalty area. Attempt missed. Simon Walton (Stevenage) right footed shot from outside the box is close, but misses to the left. Bira Dembele (Stevenage) wins a free kick on the right wing. Attempt missed. Charlie Lee (Stevenage) right footed shot from outside the box misses to the right. Goal! Stevenage 2, York City 2. Tom Pett (Stevenage) right footed shot from the centre of the box to the bottom right corner. Assisted by Ronnie Henry. Jon Ashton (Stevenage) wins a free kick in the attacking half. Goal! Stevenage 1, York City 2. Chris Whelpdale (Stevenage) header from the centre of the box to the high centre of the goal. Assisted by Bira Dembele. Substitution, Stevenage. Adam Marriott replaces Cameron Lancaster. Attempt missed. John McCombe (York City) right footed shot from the left side of the box is too high.